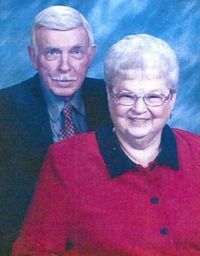 Donald L. (Don) Shupe, 89, of Roanoke went home to be with the Lord, Tuesday, May 16, 2017. He was preceded in death by his wife of 65 years, Betty Jo Aker Shupe; parents, Edith and Bill Shupe; brothers, Charles, Cecil, Sheridan, J.C., and Raymond Shupe; sisters, Ruby Edwards, Shirley and Doris Shupe. Mr. Shupe retired from Cavalier Equipment Company and was formerly employed by Man’s World. Don was an avid bowler, an Atlanta Braves fan, enjoyed gardening, and sitting on his porch in the warm sunshine. Surviving are his daughter, Donna Paxton and husband, Bobby; granddaughter, Kimberly Pauley and husband, Jason; brothers, Wayne Shupe and wife, Loretta, Ralph Shupe and wife, Tonya; sisters, Dorothy Zeisz and husband, Ray, Joanne Tauch and husband, Arnold, Jean Quinn and husband, Richard; sisters-in-law, Jean Spitler, June Testerman, Mary Ann Aker; brothers-in-law, Frank Aker, and Jim Testerman; his devoted K-9 companion, Lady; and numerous nieces, nephews and other family members and friends. In lieu of flowers the family suggests that memorials be made to Covenant Community Church P O Box 1214 Salem, Virginia 24153.